Every summer, the Alutiiq Museum and Archaeological Repository hosts a community project in Kodiak. Students and community members join in. This season, they are excavating a site on a little island off Near Island, which appears to be a subsistence camp from thousands of years ago. Down a trail through stands of towering Sitka spruce, across a rocky beach and along an outcropping, is a freshly dug four-by-five-meter patch of dirt where researchers believe that thousands of years ago Alutiiq people once caught and smoked cod. “So, we are at the archaeological site called Qik’rtangcuk,(which means little island in Alutiiq,)” Molly Odell, a project manager and archaeologist at the museum, said. It is day three of community archaeology and, through the filtered light of an alder canopy, the all-volunteer team of 10 is uncovering a large fire pit – about three meters across. Initial discoveries point to the site being a seasonal camp. They’ve already dug up a fist-sized rock fishing line weight, called a plummet, which indicates the site could be around 3,000 years old. Patrick Saltonstall is Curator of Archaeology at the Alutiiq Museum. 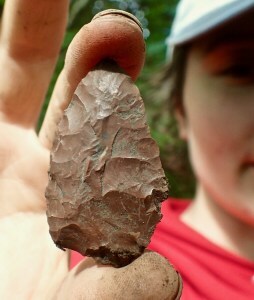 “Archeology is all about using evidence to come up with what happened in the past. The story is what really matters,” Saltonstall said. As Saltonstall explained, a big part of figuring out the story comes from mapping the site. He calls out measurements: 106, 113, 110. “It is elevation in relation to data. So, we’ll be able to make a three-dimensional map of the site,” Saltonstall said. Peter Ellis is a Ph.D student in archaeology at the University of Pittsburgh who traveled all the way to Kodiak to volunteer on the project. Ellis worked on another community archaeology dig in Dutch Harbor last summer. He’s an experienced digger who says the way you dig matters. The very first day of the dig, volunteer Keith Bruce, a sophomore at Kodiak High school, found the artifact mentioned earlier — the fishing weight. But in between, it is a lot of digging until that magical moment when your eye spots something. And then the crew finds something else: another plummet, which Patrick Saltonstall described. Another clue that, hopefully, when added together with all the others, will create a small window into the world of Alutiiq people in Kodiak thousands of years ago. KMXT intern Zane Navarro contributed to this story.